Do you remember in our post about making Turkish rice that we told you about a friend who is a great cook but her husband just loves to eat rice and yoghurt? Yeah, well she’s gonna feature in this post as well today as she is the person who first introduced us to paçanga böreği. It was Christmas Day and we’d invited a few Turkish friends to eat with us – some traditional foods and some not-so-traditional. Our friend turned up at our house with a plastic tub filled with uncooked pastries (börek). “I’m going to cook us some paçanga böreği,” she announced. Pronounced ‘pachanga,’ our first thought was that she had made some type of Mexican dish. Well, it just doesn’t sound very Turkish, does it? But Turkish it is, and, when we she’d cooked it, we tucked in and it was yet another Turkish dish that we fell in love with. Börek recipes (pastries) are very popular in Turkish cuisine and paçanga böreği is much loved because of its filling – pastırma. Pastırma is salted, aged, air-dried beef that is coated with a cumin-based paste called çemen and, although there are many different types of pastırma, the central Anatolian city of Kayseri, near Cappadocia, is the place most associated with this beef. You can see pastırma in the photo above, for sale in the Egyptian Spice Bazaar in Istanbul – the three oblong shapes. It is sold very thinly sliced, like Italian prosciutto and has a strong flavour. It’s these strong flavours that make it a perfect filling for börek! So what other ingredients are a part of our paçanga böreği recipe? Well, we need pastry for starters. In Turkey, we buy fresh sheets of yufka from the local yufkacı. 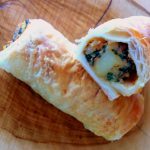 If you can’t buy yufka, phyllo pastry is very similar, just a bit thinner, so you’ll need to double up on the phyllo sheets. Our paçanga böreği recipe also needs kaşar cheese. Kaşar is a mild, non-crumbly Turkish white cheese, and, again, if you can’t get that where you are, a similar mild cheese can be a substitute; Edam or Cheddar, for example. Yufka is sold in huge circular sheets and, for making paçanga böreği, we cut it into quarters so that we get four triangular shapes. Each triangle is brushed generously with an egg and milk mix and then, pointed edge facing away, we put some grated kaşar cheese along the rounded edge, a couple of inches higher. A bit of our sauteed red pepper is sprinkled along the cheese and then we add the pastırma (around 1 – 1.5 slices for each paçanga). Now all we need to do is fold the rounded edge over our filling and then fold in each side (photo 3). Now we just keep folding upwards until we reach the point at the top. Our paçanga böreği recipe makes 6 paçangas. Paçanga böreği is fantastically tasty and is always a favourite when we invite friends round for food. It makes a good meze. First of all sautee your red pepper until it softens and allow to cool. Take a yufka triangle and place on a flat surface with the pointed edge facing away from you. Brush all over with the egg and milk mixture. Take some of your grated cheese and arrange it into an oblong shape a couple of inches above the rounded edge, leaving a rough 3 inch gap either side. Sprinkle some of the red pepper over the cheese. Now arrange pastırma over the top of the cheese and pepper. Fold the rounded edge over the top of your filling and then fold in both sides, too. Now, keep folding until you get to the point at the top. Repeat this process until you have used your 6 triangles. Heat some sunflower oil in a pan for deep frying. When the oil has heated, plunge your paçanga böreği into the oil in batches and remove when the pastry is golden brown. This only takes a couple of minutes so don't leave them unattended. When you paçanga böreği is golden brown, remove from the oil and place on kitchen paper to drain. Serve immediately and eat while hot. Please note, calories are per paçanga, are approximate and are meant as a general guide. They will vary depending on the brand of cheese, the type of pastırma and whether you deep-fry or oven bake your paçanga böreği. If you like, you can also add a chopped chilli (we do) to your sauteed red pepper. Paçanga makes a good starter to a meal and is tasty, served with a simple salad. They're filling, so one paçanga per person is enough as a starter. And that’s how you make paçanga böreği. 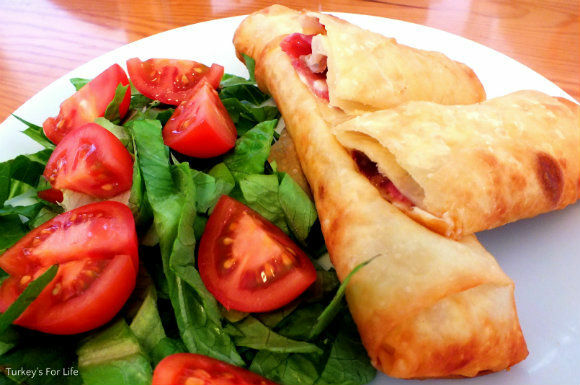 We love to eat paçanga böreği with a simple, crispy salad of lettuce and cherry tomato. If we have it as a starter, one paçanga böreği is enough but we will eat two as a main meal. Deep-frying paçanga böreği is quick and easy and a very common way to cook them. However, if you’re not a fan of deep-frying, you can also bake your paçanga böreği in the oven at 200 degrees C for around 25 minutes. Brush the tops with egg and sprinkle with sesame seeds, if you like, before baking. And if you want a more firm, extra crispy coating, some people also coat their paçanga böreği with corn flour before deep-frying. We prefer a lighter pastry, however, so we don’t use this method. If you are using an alternative cheese to kaşar, make sure it is mild and not salty. Pastırma is salty, so if you add a salty cheese, too, it can be overpowering. Our paçanga böreği recipe can be found in the Turkish Börek Recipes section on our page of Turkish recipes. Paçanga always sounds like a large dangerous knife to me. Or the noise it makes when it drops to the floor. I saw your link on Archers of Okcular and as this is a dish I’ve never tried before I came straight here with great expectation. Thanks for this recipe. I love using yufka and make all kinds of börek but had not sussed what this one was. I always cook mine in the oven and this one is priority one on the list now as we both love pastırma. Ahhh, bet there’s a Turkish community somewhere there, Joy. 🙂 We’re lucky that our nearest restaurant, Denizatı, serves paçanga on their meze menu, too. But always good to make your own, too. 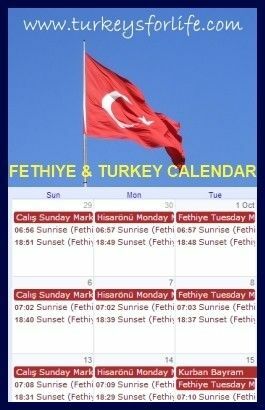 Hmmm, best get looking for that Turkish community so you can locate some pastırma! 😉 Good luck. I’m not too keen on pastırma, but I love börek, so I might give it a try. It might change my mind about pastırma.